Washington, DC— As the US government loosens environmental rules, states are investing more in energy efficiency and delivering increased power savings, according to the 2018 State Energy Efficiency Scorecard. 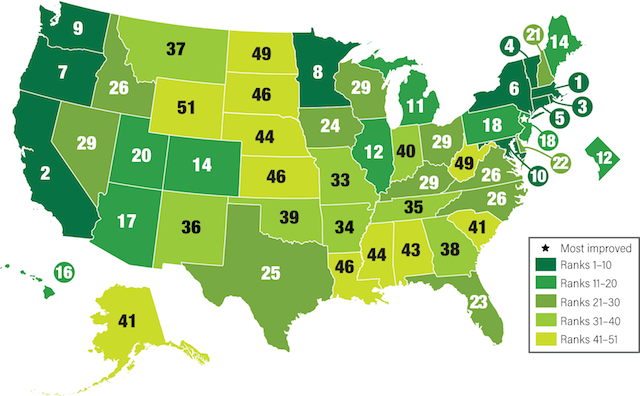 This 12th annual report from the American Council for an Energy-Efficient Economy (ACEEE), released today, identifies the leaders (Massachusetts and California), the most-improved states, notably New Jersey, the states that lost ground such as Iowa, and those lagging behind, including North Dakota, West Virginia, and Wyoming. The scorecard offers mostly good news about energy efficiency — the nation’s third-largest electricity resource. In response to federal efforts to freeze US vehicle and appliance standards, quite a few states worked to retain their own standards and to promote electric vehicles as well as zero-energy buildings. While some, like Iowa and Connecticut, saw legislative attacks within their states, others — including Virginia, New York, New Jersey, Colorado, and Arkansas — unveiled plans to boost investments in efficiency and clean energy, often driven by concerns about climate change. New Jersey improved the most, moving up five ranks to #18. The Garden State set new annual energy savings targets and took steps to rejoin the Regional Greenhouse Gas Initiative, a multistate cap and trade emissions compact. Missouri, Connecticut, Colorado, and South Dakota showed marked improvement. Other improved states include Nevada and North Carolina. Massachusetts continued to rank #1 overall. It launched a plan to set new three-year energy savings targets and approved utility spending for grid-scale modernization. A close second is California, which led efficiency efforts in three areas: buildings, transportation, and appliances. These leaders are followed by Rhode Island, Vermont, Connecticut, New York, Oregon, Minnesota, Washington, and Maryland. States increased investments in energy efficiency in the utility sector. They spent nearly $8.0 billion last year, up from $7.6 billion in 2016. The result was a 7.3% increase in electricity savings (nearly 26.5 million megawatt-hours) — enough to power about 2.5 million US homes per year. Weston Berg, lead author, discusses Scorecard findings. States ramped up efforts to create the utility of the future. Ohio, Rhode Island, New York, California, and Minnesota have major plans in place. They’re looking to modernize grid infrastructure, leverage data, and deploy more distributed energy resources. The scorecard assesses state policies and programs in six areas: utilities, buildings, transportation, state government, combined heat and power, and appliance standards. It highlights best practices for promoting energy efficiency, typically the lowest-cost way to meet customers’ energy needs. Such efficiency improves air and water quality, strengthens grid resilience, promotes equity, and improves health and comfort. EDITOR’S NOTE: An electronic copy of the ACEEE 2018 State Energy Efficiency Scorecard report and a high-resolution image of the ACEEE logo will be available upon request. A replay of the webinar that announced the findings will be available at [link] as of 5 pm EDT on Thursday, October 4, 2018.